Positive press can open doors for individuals and organizations in dramatic ways. For start-ups, awareness is generated amongst investors, clients and future employees that otherwise wouldn’t be possible. For a university, it leads to visibility among key stakeholders like current students, prospective students, alumni and the community. Rarely does ongoing positive media visibility happen by accident. Effective media relations requires an ongoing strategy, understanding how a story gets picked up in the press and the ability to explain an organization’s messages and thought leadership so that it is understandable to a media outlet’s different audiences. All too often, individuals and organizations resort to putting together a press release and blasting it to some sort of cobbled together list. Basically, this is the pray and spray approach and is ineffective over the long-term. The key to media relations is rooted in the term itself: relationships! It is very hard to develop relationships just by hunkering down in our offices. Sure, we can do online research and leverage media tracking tools in different ways, but to most effectively develop relationships, it is best to meet face-to-face. I have experienced the benefits of doing this throughout my career working in media relations, both as a consultant and in prior roles leading the public relations for Duke University’s Fuqua School of Business and IMD Business School in Switzerland. Particularly impactful was attending media events in different parts of the world where I was able to meet several journalists in one day and learn about their different editorial priorities. Upon returning to the office, I would nurture those relationships by connecting the dots between what journalists were looking for and the expertise within the schools I represented. As a result, I was able to generate extensive and ongoing visibility in strategic markets like India and Brazil and with targeted media outlets, like The Economist and the Financial Times. The events I attended in the past were all in major international markets, like New York, Los Angeles, London and other international capital cities. I wanted to bring this type of event to North Carolina as a means to connect the media with communicators, start-up founders, academia, those working in tech and policy makers throughout the state. 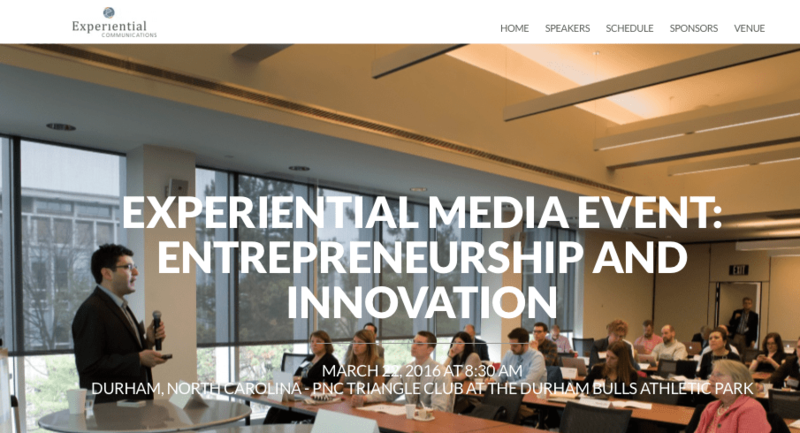 On that note, I decided to launch the Experiential Media Event: Entrepreneurship and Innovation on March 22 in Durham. In addition to arranging for many of the top North Carolina media to attend the event, I have also been able to line up journalists from New York and international markets. American Underground and Exit Event as host sponsors have arranged a great event venue: The PNC Triangle Club at the Durham Bulls Baseball Park. Other journalists from global markets who will attend are from Westdeutscher Rundfunk (Germany), the European Broadcast Union, WeltN24 (Germany), the Korean Broadcasting System and the Anhui Broadcasting Corporation (China).